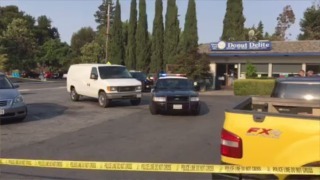 A person is hospitalized following a stabbing in Menlo Park, police said late Tuesday. Police said around 5:35 p.m. officers were flagged down by a person reporting a stabbing in the 800 block of Willow Road. Responding officers located a male victim in the parking lot of 840 Willow Road sufering from multiple stab wounds. The victim was transported to a hospital. Officers searched the area and were unable to locate any suspects. The stabbing allegedly took place in front of 732 Willow Road, a small strip mall anchored by Donut Delite. Police during its initial investigation advised residents to avoid Willow Road between Okeefe Street and Chester Avenue. Police said the scene was cleared shortly after 7 p.m.
An investigation is ongoing and police late Tuesday were not releasing a suspect description. Anyone with information is asked to contact Menlo Park Police detectives at 650-330-6300 or the anonymous tip hotline at 650-330-6395.